There once lived a traveler. He got lost and no one could give him exact direction where to go. He got lost in the dense jungle. Four robbers chased him but the traveler could escape easily by lurking in the dense forest. In the forest an elephant chased him. 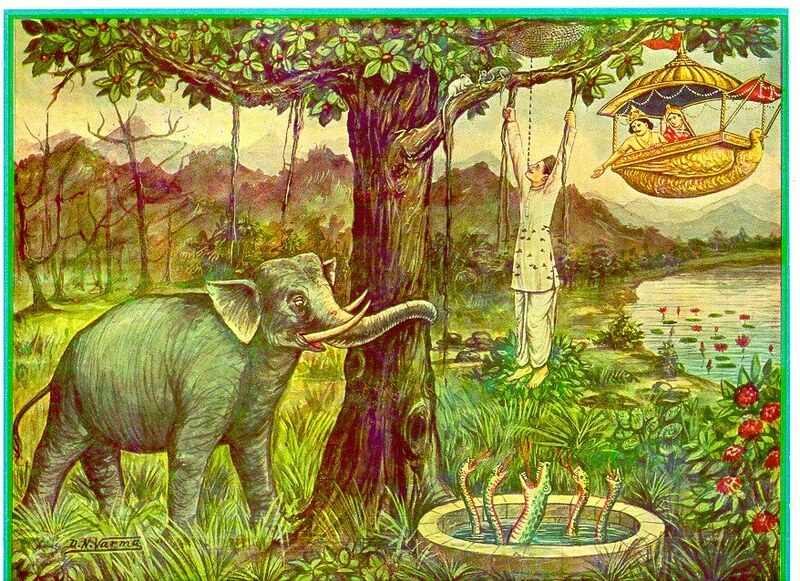 To save himself from the elephant the traveler jumped down into a well. He grabbed a branch of a tree which was just beside the well. Below him, in the well, were an alligator and four snakes. Up, he saw two rats, one black and the other white. They were chewing the branch on which the traveler was hanging. Then, at the same time few honey drops from beehive fell in his mouth. 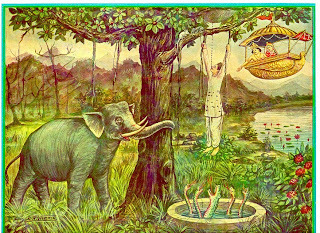 The elephant that chased the man approached there and began to shake the branch violently. Now, as the tree was shaking, a few bees stung the poor traveler but as he licked the honey, he would forget his problems (the snake and alligator, the elephant and the rats and the bees). Now, at that time an angel couple was flying by. By seeing the miserable position of the traveler, angel offered him help. The traveler, now absorbed in taking taste of the honey drops asked the couple to wait for a second until he tasted the next drop of honey, so they waited. Then angel asked him again and the traveler said for wait for few seconds and this went on. The couple got tired of waiting and eventually they left. Few minutes later the mice cut down the branch and the traveler fell inside the well and ultimately died. 1. The story is symbolic for the troubles of any living being. 2. The traveler represents a worldly soul. 3. The elephant is death, something everyone must face. 4. The four snakes and alligator represent the four passions (anger, deceit, greed and pride) and rebirth respectively. 5. The branch cut by the two rats represents the life-span of a living being which is continuously being reduced by the day and night. The white rat represent day and the black rat represent night. 6. The bees represent daily problems. 7. The honey represents sensual pleasures in which all living beings are absorbed. 8. The celestial couple who offered the traveler a shelter represents True Religion. Thus, enlightened beings have given the above simple example to describe the real nature of mundane world. We would realize that how unsafe it is to be absorbed in the sensual pleasures instead of indulging in our real self. One can get rid of the cycle of birth-death and rebirth only by realizing his/her real self and by destroying all karmas by performing external and internal austerities.